We're here to help you bike. Learn to repair or ride your bike! The Bike Cave can teach you how to repair your bicycle and how to safely cycle in San Marcos. Your one-stop bike shop. The Cave sells used bicycles that have been repaired and inspected by our techs. We also sell parts and accessories. Know how to fix your bike, but your roommate won't let you use the living room as a shop? Come use our tools and workspace, free of charge. 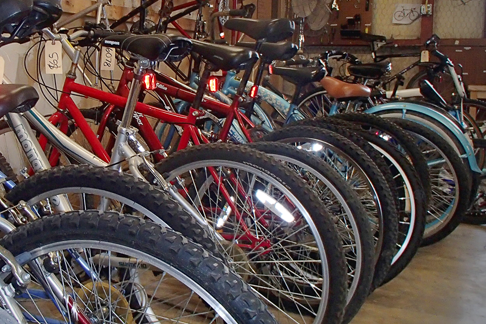 Texas State's bicycle shop began in 2007 as a collaboration between Auxiliary Services, members of National Association of Environmental Professionals (now ECO), and the Environmental Service Committee. Student staff and volunteers began constructing a working space to repair bicycles, safety check donated bicycles, and recycle inoperative bicycles. The original Bike Cave was located in the Thornton House garage and basement. This location, plus storage at the University Print Shop, made up about 1000 square feet of space which soon proved too small to meet the growing demand for bicycle repairs by Texas State students, faculty, and staff. The Cave shut its doors at Thornton House garage in December 2008 to move to a new location in the Pecos building. This second location opened on February 9, 2009, and featured additional indoor work stands; tools; easier access to parts; ample storage space; and far more space to grow. Increasing academic and institutional space requirements necessitated the closure of this location at the end of the 2009 fall semester. The newest location, in room 100 of the Colorado building, opened on February 1, 2010, with just under 1200 square feet of work space and on-site storage. The location allowed the addition of an air compressor for students to easily air their tires at all five workstations, and an outside air hose and repair station was added for after-hours availability. 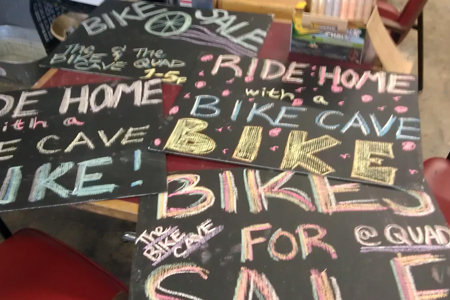 The addition of a credit card reader in 2015 expanded the Bike Cave’s ability to sell merchandise and bicycles. And the 2016 donation of patrol bicycles from University Police precipitated a bicycle rental program. The Bike Cave is looking forward to continuing its long history of serving the cycling needs of the campus.